Since I make my own “desktops,” I thought I would upload a few and see if they are popular. I have and will provide them in two sizes – standard and widescreen. The standard screens have an aspect ratio of 4:3 and the widescreen ratio is 16:9. Each of the standard and widescreen monitors comes in three sizes. There may be additional or custom sizes but I think these ones are the most common. Standard sizes (4:3 ratio) from smallest to largest … 1024 px by 768 px, 1600 px by 1200 px, and 2048 px by 1536 px. Widescreen sizes (16:9 ratio) from smallest to largest … 1680 px by 1050 px, 2520 px by 1575 px, and 3360 px by 2100 px. I have designed each in the largest size since, usually; better results are obtained by sizing DOWN rather than up! Start > Control Panel > Appearance and Themes > Pick a task … > Change the desktop background > Display Properties > Browse > find the correctly sized jpg file I want. If any of you use Desktop 1, you’ll have to insert a photo and resize the png file, if necessary, and then save it as a jpg in a folder of your choice. You may also need to rearrange your desktop icons. I’ve left space to the left of the screen because that’s where my icons are usually placed. Hope some of you have fun with this. 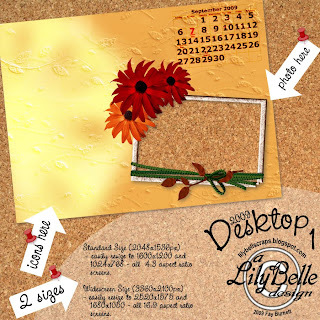 Oh yes, Val has a couple of beautiful desktops available on her blog – Vj’s Scraproom. There’s a link in the sidebar. Thank you so much for this Freebie. I want to let you know that I posted a link to your blog in Creative Busy Hands Scrapbook Freebies Search List, under the Page 11 post on Sep. 04, 2009. Thanks again.